In suits of any sort. Though better none at all. I published an article today in the Philadelphia Inquirer about the "silly hysteria" in France over the novel female bathing article called the burkini, saying it's not a threat and the France authorities should concern themselves with serious matters. Well the weather on the Riviera is hot and so is this topic. I pursue updates here. 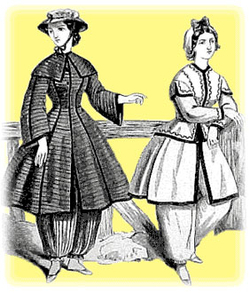 Bathing dresses as pictured in "Godey's Lady's Book" in 1864. The Burkini looks much closer to what both women AND MEN were wearing in the West, just three generations ago, than modern swimwear does. The next thing you know, French children will be required to have tattoos in a few years, or go naked, the way this is trending. Perhaps men will also be required to shave their heads, and pierce their ears. (2) The rabbi of the Great Synagogue of Paris, Moshe Sebbag, has endorsed banning the burkini. Comment: I wonder what he has to say about "Kosher Swimwear"? 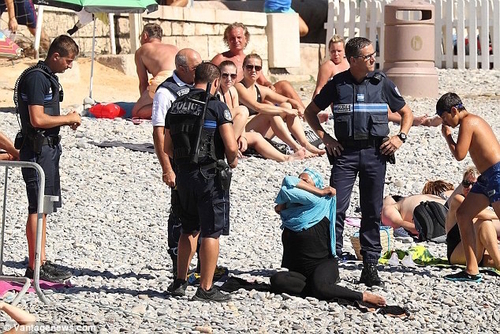 (3) As the Daily Mail puts it, the ban on the burkini in some French towns "is threatening to turn into a farce" with police officers armed with pepper spray and batons imposing the ordinance on female beach goers. It reports that around ten women have so far been given criminal records for wearing burkinis in Cannes and then forced to leave the beach. Four of them were fined and they all received "warnings" that are part of their police records. a. "Four burly cops stood over the middle-aged woman, who had been quietly sunbathing on the Promenade des Anglais beach in Nice - yards from the scene of the Bastille Day lorry attack - and watched her take off a Muslim-style garment which protected her modesty. It is thought the woman was given a warning about the dress code on the beach and was handed an on-the-spot fine. Four police officers find the offending burkini woman asleep among the bikinis. The police officers watches as she takes off the offending garment. b. "A young Muslim mother was ordered off the beach at Cannes and fined for simply wearing a headscarf. Three armed officers pointed a pepper spray canister in the 34-year-old's face and told her she was in breach of a new rule outlawing swimming costumes that cover the entire body. She said the 'racist' officers simply wanted to humiliate her in front of her children and other family members, even though she was not even wearing a burkini. ... Mathilde Cusin, a journalist with the France 4 TV channel who witnessed the entire incident, said: 'I saw three police officers watching the beach. One of them had his finger on the trigger of his tear gas device, no doubt containing pepper'. ... Then Ms Cusin said the officers went for Siam, was wearing 'a simple hijab [a headscarf that does not cover the face] around her hair.' People then started shouting insults at Siam, telling her she was not welcome in France, and that she should 'go home'. ... Siam accepted an on-the-spot fine of around nine pounds, and her details were recorded on what will amount to a criminal record." c. "Video also emerged of armed police waiting for Muslim women to come out of the sea at nearby Nice, and then warning them about their choice of headscarves. ... The video, which was posted on Twitter, shows children crying and shouting as the women are spoken to by the officers." Comment: The metaphorical fashion police have become a reality. (4) Agence France-Presse and France 24 report that "Burkini Sales Soar in Wake of French Beach Ban, Designer Says," showing another counter-productive angle of the bans. The controversy has created a new market for her products, says Aheda Zanetti, 48, who invented the burkini. "I can tell you that online on Sunday, we received 60 orders – all of them non-Muslim," far more than the usual 10-12 orders on a Sunday. "It's just been so hectic." Some are cancer survivors who seek protection from the sun. A French-Muslim group has called for a ban on what it terms "woefully-endowed white walruses terrorizing our kids in public," alongside the repeal of a string of municipal measures outlawing the burkini in southern France. Speaking to reporters yesterday, Dr. Yasmina Al-Hazeemi of France's Think of the Children! Foundation urged the nation's parliament to criminalize the tight-fitting male swimsuit, framing the so-called 'budgie smuggler scourge' as a public safety crisis: "These obscene bathers are in fact evil terrorists imperiling the mental health of millions," claimed the Algerian-born pediatrician. "For the sake of our traumatized children and the very soul of our Republic, we must crush this shameless cult of sagging manboobs, shrivelled raccoon balls and itsy-bitsy Sarkozian wee wees!" Aug. 24, 2016 update: Two graphics from Le Point magazine show where the burkini ban is going. One shows the towns that ban it. The other shows the legal status of various Islamic female garment in France. 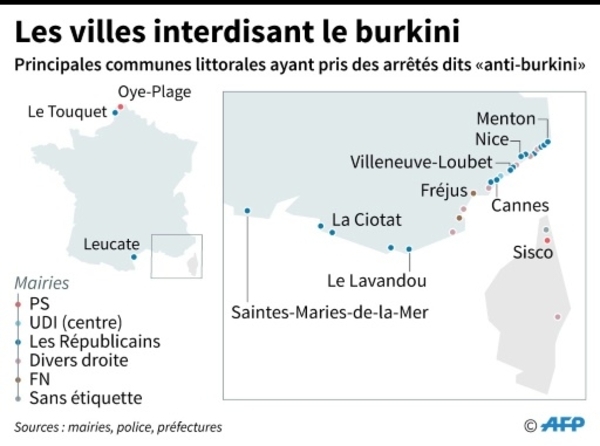 Towns that ban the burkini. The legal status of female Islamic garments in France. Aug. 25, 2016 update: In a further example of silly August hysteria, former French president and candidate for president Nicolas Sarkozy has joined the fashion police, calling the burkini "a provocation" and endorsing its ban. "It's a militant political act, a provocation. Women who wear it are testing the strength of the [French] republic" ("C'est un acte politique, militant, une provocation. Les femmes qui le portent testent la résistance de la République"). Aug. 26, 2016 updates: (1) The ban and the brouhaha around it are not just great for the burkini business but also for the "Kosher swimwear" business. Yardena G, a haredi mother of nine from France who lives in Jerusalem, owner of the Sea Secret line of modest swimwear for religious Jewish women, expects the ban will "end up boosting sales in a big way." 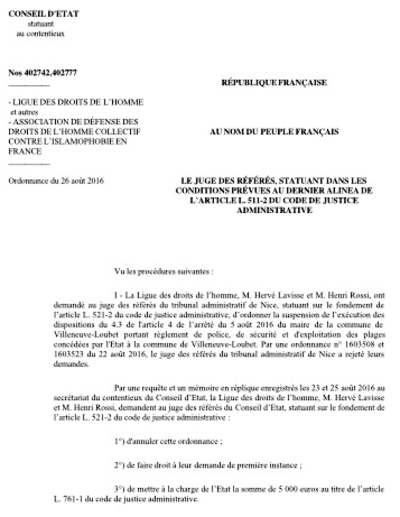 (2) Of course, it was inevitable: the Conseil d'Etat, the highest administrative court in France, completely knocked out the anti-burkini regulation in one town (Villeneuve-Loubet) while implying that the ruling applies to the whole country. Will this now end the silly season? Can we stop handing victories to the Islamists and start combating them on the real battlefields? The ruling by the Conseil d'Etat. When a problem has no solutions, the only thing left to do is to change the topic. And so, in the wake of daily attacks, our continent is spending the summer talking beach-wear. Some people may think this is better than nothing. But it isn't. It is fiddling while Europe boils. 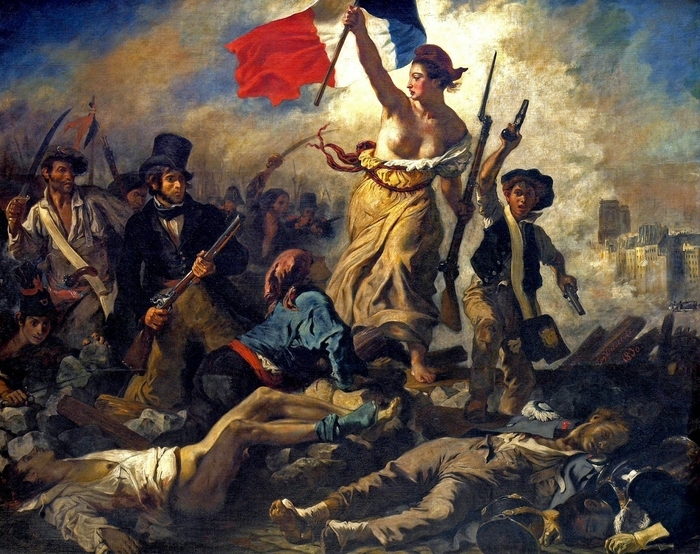 Eugène Delacroix's 1830 painting of Marianne, "Liberty Leading the People" ("La liberté guidant le peuple"). Sep. 8, 2016 update: France's President François Hollande kicked off his re-election campaign with a broadside against the burkini ban: "While I'm president, I will pass no kneejerk law that would be as inapplicable as it would unconstitutional." Sep. 5, 2017 update: The burkini is also banned in some instances in Egypt. For details, see Amira Sayed Ahmed, "Burkini Bans Causing Waves in Egypt."